Hebrews 13:8– Jesus Christ, the same, yesterday, today, and forever. I spent Friday afternoon at the Le Sueur County Pioneer Power Show. What started out 43 years ago as a small local Threshing Bee, has grown into one of the largest shows of its kind in the Midwest. It has a little of everything of how it used to be on the farm: grain threshing, teams of horses, giant steam engines, antique tractors, horse powered well-drilling, corn shredding and shelling– and a little village which includes a steam-powered sawmill, creamery, schoolhouse, church, and working blacksmith shop. It is 120 acres of memories. And it’s fun. People like getting together to remember the old times. They enjoy looking at all that old machinery cranked up, smoking and snorting. It is a whole weekend of talking about days gone by. Sometimes, even oftentimes, we might long for those simpler days. Now of course, we wouldn’t want to go back to doing everything like it used to be done. For example, now that a lot of farmers are used to 24-row planters, could you imagine going back to planting corn with one of these– one seed at a time? And now that we have combines bigger than the average pioneer’s log cabin, could you imagine going back to picking corn with one of these husking knives– one corn cob at a time? Only 75 years ago most farmers were still using one of these instead of a combine or even a one row corn-picker. Somebody once said, “What was difficult to endure, is sweet to remember.” That could be the theme of Pioneer Power days, with all those tools, implements, machines, and other items of the good old days. It is great fun to see it all now; but anyone who is old enough to remember using those old tools and machines can also remember how hard they worked when those were the tools of daily life. It’s fun now to see it all going again, but when new and more convenient machinery came out, most folks were quick to park the old stuff out in the weeds behind the machine shed and go with the new. But “What was difficult to endure is sweet to remember,” so I enjoy going to Pioneer Power with my parents because everything they look at reminds Mom and Dad of something. They’re both talking at the same time, recalling how their folks had one of these, or how they used to work with one of those, or a specific day when this or that broke down and what a miserable day that was, and so on. What was difficult to endure is indeed sweet to remember. This two-part meditation will be about tools, and then about remembering, and then, about tools for remembering. First of all, about tools. Humans have always been tool-makers, and tools are a big part of what folks go out to Pioneer Power to see. 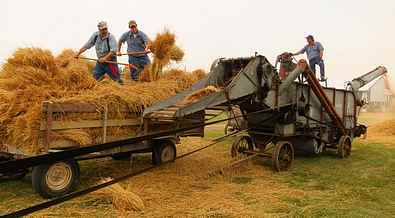 From very simple tools, like the old corn planter, to the massive steam engines and threshing machines; tools are to make work easier. So, I’ll picture some old tools and use them to illustrate my point. 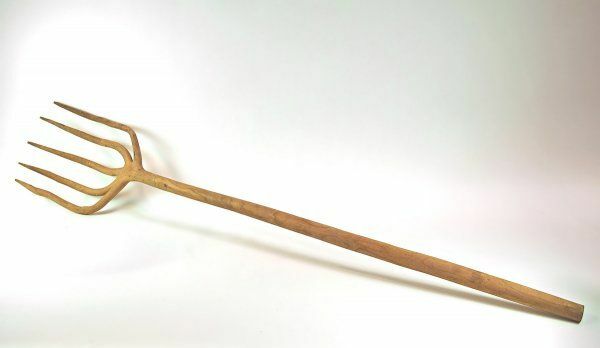 This first tool was tied to a heavy stick and used as a club by the Sioux Indians in Minnesota. 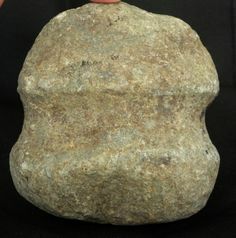 It is amazing to think that a mere 180 years ago, most of the residents of Minnesota were still living in the Stone Age, and the best tools they had were hewn out of stone. This club was primitive and crude, but you’d be much better off hunting or meeting an enemy with this in hand than without it. The early settlers had iron tools, but they weren’t able to bring much from the old country in those old trunks that you now see in antique stores. And in their first years here, the old pioneers weren’t able to afford much. 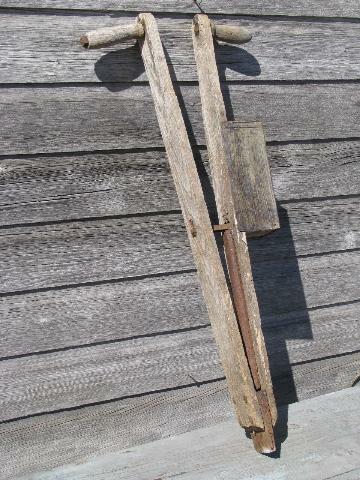 So a few metal tools were brought and used to make wooden tools, such as this old pitch fork. The whole thing was carved out of a single piece of wood. It makes me wonder about the story behind it. Was this a particularly poor farmer who was forced to depend on this instead of buying a better one, or is this what all the earliest pioneers used at first? Either way, I am sure the maker of this pitchfork told all his neighbors of his good luck in finding such a suitable piece of wood. This is an item from not all that long ago. Before refrigerators and freezers, saws like this were needed to cut blocks of ice out of lakes and rivers over the winter. Those blocks were then packed in sawdust for use in the ‘icebox’ throughout the rest of the year. Looking at these tools, and thinking about their use, makes me think about the hands that once held them, used them, and worked with them to make a life– we might even say, to stay alive. Or, imagine an old pioneer, out in the pasture getting the cows in for milking when he saw some tree branches, or roots perhaps, and could visualize a new pitch fork. So he took it home, and then, that night by the fireplace in the house, started whittling away. Or think of who might have used that corn husking knife. Maybe it was a teenage boy, spending all day in the brisk Fall air, going up and down the rows, harvesting one cob at a time, all day, all week, just looking forward to the family’s once a week trip to town on Friday night when he’d see his friends. All the while, he’d be day-dreaming, thinking about when he would be old enough to leave that dumb old farm and get some other kind of work. He had been hearing about something new in the big city– cars. That’s what he wanted to do. He wanted to work on cars. And then he was going to live in town, not just go there on Friday evening. Husking corn cobs was repetitious, not requiring any thought, and it left a young boy with lots of time to think and to dream. And he knew he wasn’t going to be doing that boring work all his life. And I’d like to know the story of that old Sioux club. Stone age technology did not change much over the centuries, and a rock like that would last a long time. So I wonder when this might have been made. It could be a thousand years old. It may even have been made, used for a couple hundred years, then lost for a couple hundred years, and then found again. What was it all used for? Perhaps pounding the stakes in for the tepee, or for building the bracket over the camp fire to roast rabbits on. Was it also used in hunting, or in defense against wild animals? I wonder if it was it ever used on a human head. We can imagine all sorts of things about those who used these tools, and the other tools at Pioneer Power. But of one thing we can be certain. The hard working hands that first held these items are working no more, but are now still, dead and cold, and folded together in the grave, down in that black earth that they once walked on, till under, and fought over. Another thing we can be certain of is that all of the hands that handle these items today will also one day be still and down in that same dark earth. Our tools are made of stronger stuff than we are. With a little care they can go on and on, to new owners to use or to display at a threshing bee. But we are so much more fragile. No matter how much we take care of ourselves, we won’t last. The Bible says we vanish like a mist. I think about that every time I go to an estate auction. There, spread out over the yard, are the tools and furniture and possessions of a lifetime. It is all still there; but the person who owned those items and used them and cherished them has vanished. Our tools go on, but we don’t. People go to Threshing Bees and to museums to remember the past; and one of the ways we remember the past is by looking at the tools and possessions of those who lived before us and are now gone.